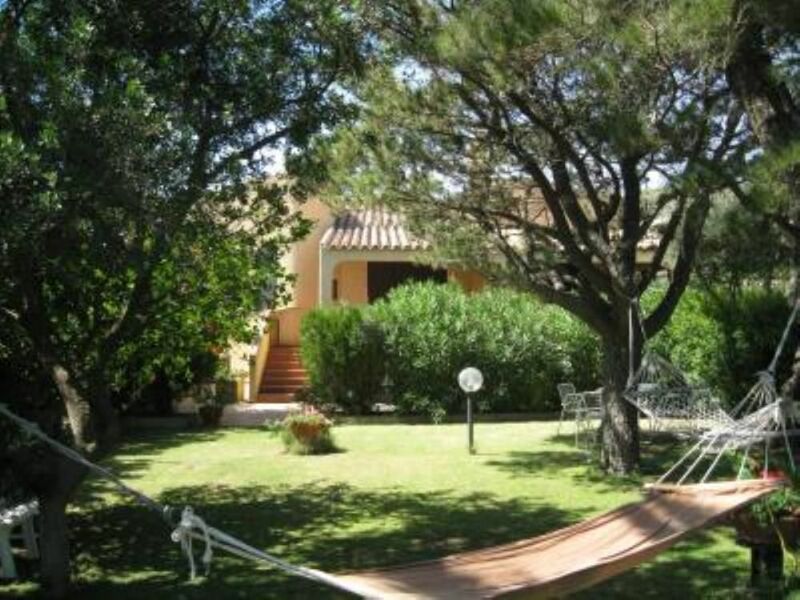 This is a spacious, very attractive and welcoming Villa, 50 m from the white sandy beach of Genn'e Mari beach. It's close proximity to the local beaches and restaurants makes this an ideal holiday home. The villa sleeps up to 8 People. "We were so pleased with the accommodations here! So kid-friendly! The location, just 50 meters from the beach was just perfect! The house was clean, spacious and had a large front garden which was great for the kids to run around and play in. We also loved the many options for outdoor eating as a large group of nine people...back terrace, front terrace and front garden. The surrounding area was quiet and felt remote...perfect for a relaxing vacation! Pizzeria restaurant & supermarket both within walking distances. The owner was very friendly & helpful. Overall, a wonderful stay!!" "Very close to a beautiful beach, big garden around the house and plenty of toys to play with for the kids. Supermarket on walking distance and nice trips by car to agriturismo or Villasimius." Perfekt für Familien! Nur 30m zum schönen Strand! Gemütliches, großes Haus mit vier Schlafzimmer, zwei Bädern, viel Geschirr, Spielzeug und Handtüchern. Terrasse vor und hinter dem Haus, außerdem großer gepflegter Garten. Vermieter Alberto sehr freundlich und hilfsbereit. Wir hatten eine gute Zeit in Torre delle Stelle! La casa è molto bella e spaziosa , i due portici e il barbecue sono un valore aggiunto, ma anche la vicinanza dal mare, market vicinissimo, due ristoranti a pochi passi, farmacia a circa un km, bar-ristorante a 100 m x aperitivi o cene affacciati al mare, ottima la doccia esterna , l'ampio giardino dove poter giocare o far correre bambini, ricordarsi solo di fornirsi di zampironi e autan, nel complesso la consiglierei a chiunque, proprietario molto disponibile e cortese . Spero di tornarci!! "nous revennons tout juste de cette location à 50 mètres de la plage sympa de torre delle stelle (d''autres plages pas très loin également). propriétaire agréable, petit supermarché à pied, l''endroit idéal. A noter un jardin agréable avec ses hamacs !" Villa Surface: 150 mq, Garden: 700 mq. Recently refurbished in 2005. Supplied with washing-machine, Freezer, Tv/satellite cable, Television, electric oven, Microwave, Brick Barbecue, Refrigerator, outdoor shower, indoor Fireplace. The grounds are laid to lawn with plenty of mature native Mediterranean trees and plants such as palms, olive trees, rose bushes, oleander and many more. Garden furniture supplied. Services available on request (but not included): cleaning services, baby-sitting, rent-a-bike, Guardian/caretaker, Reception, Safe, Email/Internet Access (GPRS/UMTS). Also upon request: Possibility of hiring a Sail boat 6,5 Mt, Dingy boat 4,40 Mt., horse-riding, Mountain-Bike rental. Domestic pets are allowed! Distance from the Genn'e Mari Beach (Torre delle Stelle, Cagliari): 50 mt. ; from Villasimius: 20 Km. From Cagliari: 30 Km. Restaurants: 100 mt. Supermarkets: 100 mt. ; Cagliari (Elmas) Airport: 40 Km. Port: 30 Km. Activity in the outskirts: Mountain-biking, Windsurfing, Sailing, Sports, diving, Tennis, Fishing/snorkeling, Climbing, Kayaking/Canoing. Period: 1/04 - 30/10.